What a surprise this turned out to be . . . as a lifelong, confirmed meat eater I don't do vegetarian! Hugh Fearnley-Whittingstall says of his latest book  Call me power-crazed, but I'm trying to change your life here. The object of the exercise is to persuade you to eat more vegetables. Many more vegetables. And I hope to do so not by shouting from a soapbox, but through sheer temptation . . .  To put it simply he succeeds. I had to choose three recipes to feature and it was a really difficult choice, there were just so many recipes that sounded and looked good. I have never had any time for vegetarianism and I will not get into all the arguments here but the negative effect of my attitude is that I tend to think meat in most main meals that I cook. You can be a meat eater and still enjoy vegetarian dishes and this book has brought that home to me. I read dozens of recipes I want to try cooking for myself and there are not many cooking books you can say that about. 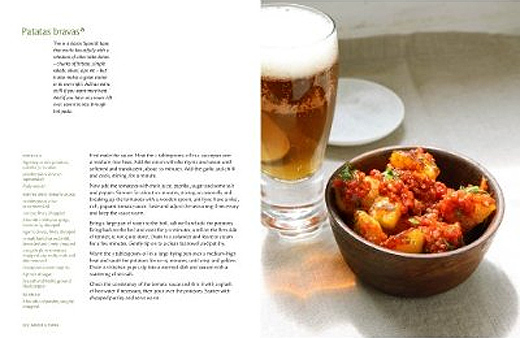 In addition many of the recipes give you the foundations for creating a dish of your own making. I have to mention the photography by Simon Wheeler because it does so compliment the recipes . . . you can almost taste them. The book as a whole is beautifully put together with illustrations by Mariko Jesse adding to the overall effect of a book that is good on the eye and recipes that are easy to read. I do like my recipes printed on a white background. It is all very well creating beautiful books but it does need to be remembered that they are intended to be used and not just to grace the coffee table. Full marks to this one as it is a very practical and usable cooking book. Glad its on my kitchen book shelf. What a marvellous book! 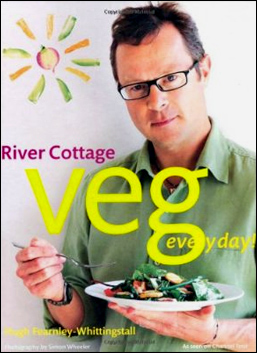 I have been a fan of all things River Cottage for a while, but being a vegetarian the number of recipes available to me in the other RC books has sometimes been limited. This is a fantastic development from the original "Everyday" book, (which is also very good) and a very welcome one for someone who has been a vegetarian for almost 25 years. There is also lots of stuff for vegans too - well done Hugh! Usually I skim through a new recipe book, and find a few things that look interesting, a lot that sound complicated or use unusual ingredients, and others that simply don't appeal. In this book, everything sounds interesting, accessible and straightforward. Beautiful photos add to the appeal. Hugh also usefully includes a list of storecupboard ingredients which are the basis of many of his recipes, and this will help to ensure that you have everything you need to get cooking. I'm not a vegetarian but I do like to regularly eat decent vegetable meals that can stand on their own. This book is by far the best vegetarian book I have ever bought. The meals are tasty, easy to do and varied. 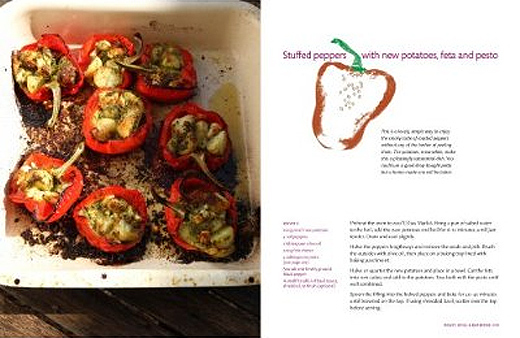 I've had the book for a couple of weeks and have cooked many of the recipes, they've all been superb. You won't be disappointed with this purchase. Since moving to a new city and starting a new job I lost the will to cook. I was making curry every day because it's what I knew and it was easy but I bought Hugh's new book the other weekend. Since then I've loved cooking again and am now enjoying all of my meals. Not only does he supply you with great recipes but these recipes put a slant on old favourites which means you can create a hybrid between your own and Hugh's ideas which so far has resulted in amazing dishes. So overall this book is extremely worth the price (amazon price anyway), all the recipes are really solid and appealing and it has lovely design. Buy it! Hugh never fails to impress and this book is no exception. I can honestly say there is not a single recipe in this book that doesn't make you want to get your apron on and head to the kitchen. 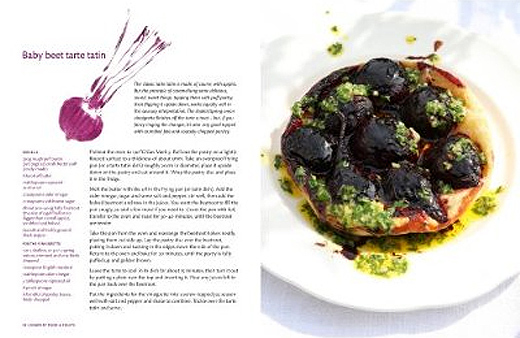 Simple but mouth watering this book is a must have for anyone who shares a love of food, vegetarian or not. 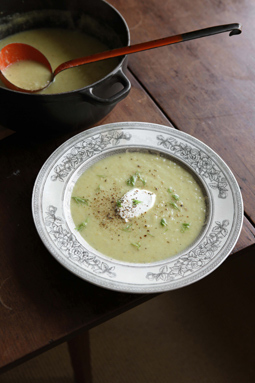 This velvety, gently aniseedy soup is given warmth and definition with a touch of orange zest. The rich-but-sharp crème fraîche added at the end balances it all out nicely. Add the shallots or onion and sweat gently for a few minutes. Add the fennel and celeriac, stir well, then cover and sweat for about 10 minutes. Add the orange zest, stock and some salt and pepper. Bring to the boil, then simmer for about 15 minutes until all the veg is tender. Reheat the soup if necessary, check the seasoning and serve, with a good blob of crème fraîche on top, a few fennel fronds if you have them, and plenty of freshly ground black pepper. This is a very simple tart to make, using good-quality ready-made puff pastry. Ive suggested various cheese and herb options below, but the basic principle is the same: crisp pastry, soft caramelised tomato, tangy cheese. Lightly oil a baking sheet and scatter over a little fine cornmeal or polenta, if you have some – this helps to keep the pastry really crisp. Roll out the pastry fairly thinly and trim to a rectangle about 30 x 25cm. Put it on the baking sheet. Cut a 1cm strip from each edge. Brush these strips with a little beaten egg, then stick on to the edges of the rectangle, to form a slightly raised border. Brush the edges with a little more egg. Thinly slice the tomatoes across into 2 – 3mm slices; discard the stalky top and skinny bottom slices. 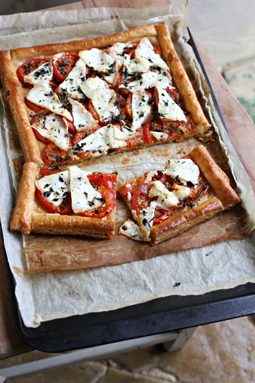 Scatter the garlic over the pastry, then arrange the sliced tomatoes on top, overlapping them only slightly. Season with salt and pepper and trickle with a little oil. Bake for about 15 minutes, until the tomatoes are tender and lightly browned. Take the tart out of the oven, scatter over the cheese and thyme, add another twist of pepper and a trickle of oil, and return to the oven. Bake for another 10 minutes or so, until the cheese is melty and bubbly and the pastry golden brown. You can serve this hot, but I think it’s better half an hour or so after it comes out of the oven, with a green salad. Replace the goats cheese with 1 ball of buffalo mozzarella (about 125g), torn into small pieces. Replace the thyme with a couple of tablespoons of shredded basil  but add this after the tart is cooked, not before. Replace the goats cheese with a generous grating of pecorino or Parmesan, and the thyme leaves with 1 tablespoon chopped rosemary. Replace the goats cheese with crumbled blue cheese. Omit the thyme. Scatter a chopped handful of chives over the tart once it is cooked. Peas and pasta with bacon or ham is a classic combination. In this dish (inspired by a lovely Nigella Lawson risotto recipe), Parmesan gives the desired salty-savoury note. Some of the peas remain whole, to give a pleasing, pop-in-the-mouth texture; the rest are blitzed to form a creamy pea sauce. Put the peas in a pan, cover with water, bring to the boil and simmer until tender – just a couple of minutes for frozen or very tender fresh peas, longer for older fresh peas. Meanwhile, melt the butter in a small pan over a low heat and add the garlic. Let it cook gently for just a couple of minutes, without colouring, then remove from the heat. Drain the peas, reserving the cooking water. Put about half of them in a blender with 6 tablespoons of the cooking water, the butter and garlic, and the grated cheese. Blitz to a smooth, loose purée, adding a little more water if needed. Combine with the whole peas and season with salt and pepper to taste. 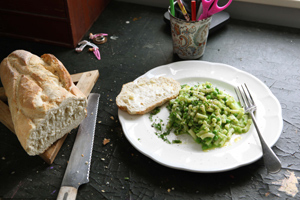 Drain the pasta as soon as it is ready and toss immediately with the hot pea sauce. Serve topped with plenty of ground black pepper and more grated Parmesan. Shredded basil or chopped flat-leaf parsley is a good, but by no means essential, finishing touch.